Quickly just a brief history lesson on who Scott & Craig Emmerson are. We are twin grandsons of the late Henry Formby (co-founding member). Our grandfather rallied his 1912 and 1923 Cadillacs for two and a half decades. Today Scott and myself carry on family tradition by rallying his 1923 every chance we get. Scott and I can remember as young kids the rallies our grandparents would take us on. The sound of the 1912 backfiring down hills just for our enjoyment, the wind whistling through our hair, the more fun we were having the faster we went. The 1912 and '23 were the fastest things on the road when our grandfather was behind the wheel. No other child could ever have experienced the thrill the excitement, we were Kings (of the Road). Sixteen years after all this fun came to an end we found ourselves more committed to the cause than ever. We have set about bringing the 1923 back to life. Some people might be aware we have had some set backs in the way of the odd conrod, but that has never dampened our spirits. We have proven that a V8 engine can be rebuilt in 12 days and driven non-stop to Adelaide (15 hours). Wheels can fly off and fuel pumps can give up the ghost in the middle of Melbourne, and this only adds to reconfirm our commitment. 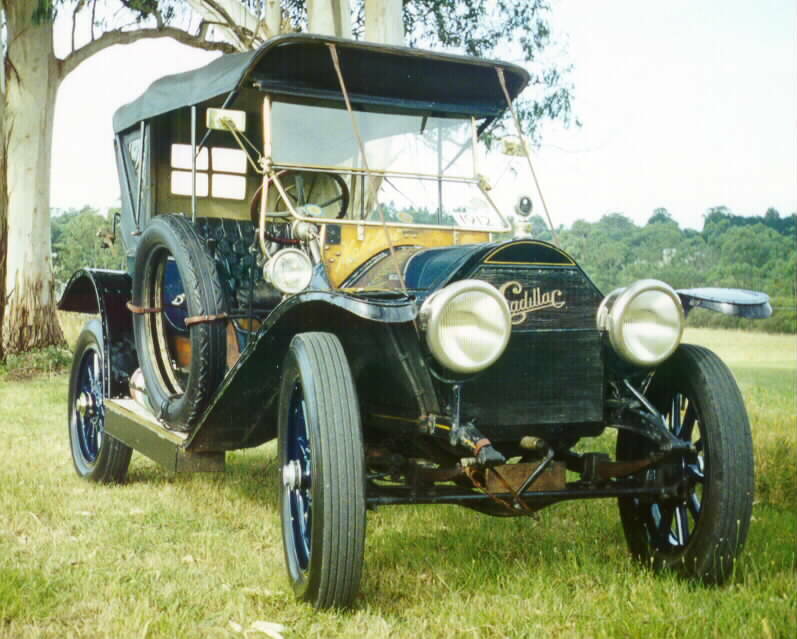 About this time last year we had the unique privilege to own what I think is Australia's most recognisable Cadillac - Ken Moss's 1912. We can only begin to understand what it must have been like to drive Mabelene across America, the people, the places, the experience. I would like to think that we are also rallying in Ken's tradition, because we know since owning Mabelene we have effectively doubled our fun and enjoyment with the Veteran & Vintage car movement, but more importantly we are proving that the Cadillac Club can incorporate every year of this fantastic make, and drive the veteran and the vintage Cadillacs on a daily basis. It is our belief that they should all be driven and never locked away. It is our responsibility to carry on the great and proud tradition that these men have paved out for us. Yours in Cadillac and all things good.